Folks describe different ‘phases’ or ‘periods’ of human settlement and agricultural development in the Islands over time. Different people use different terms for each of these (some use varying timeframes, as well,) but they seem to generally fall into Settlement, Development, Expansion and ultimately Post-Contact. It is believed that initial Polynesian discovery and settlement of the Hawaiian Islands occurred between approximately AD 1000 and 1200. (Kirch) This effectively started the ‘Settlement’ phase. For generations, the small, slowly growing population clustered around shore sites near streams that supplied them with water. Such sites are best for inshore fishing. Archaeological evidence indicates a chronology of household expansion (and, by inference, to population growth, as well as increased managerial presence and a desire to produce higher yields) starting about this time. The Islands evolved from shifting cultivation into a stable form of agriculture. Likewise, a formalization of governance was taking shape. Dr Marion Kelly noted there were three main technological advances resulting in food production intensification that started to evolve: (a) loko i‘a, walled fishponds, (b) lo‘i, terraced pondfields with their irrigation systems and (c) systematic dry-land field cultivation organized by vegetation zones. In addition, this movement toward a centralization of government allowed for development and maintenance of large projects, such as irrigation systems, large taro loʻi, large fish ponds, heiau and trails. A population peak (usually estimated at several hundred thousand) was reached around 1650 AD, more than 100 years before contact with Europeans. Large-scale irrigation works and permanent field systems were developed during the expansion period. Settlements were intruding into increasingly marginal environments, including the interiors of leeward valleys and the higher elevation slopes. Population densities in the fertile windward valleys increased, although densities in tablelands and elsewhere were much lower. At the time of Captain Cook’s arrival (1778-1779), the Hawaiian Islands were divided into four chiefdoms: (1) the island of Hawaiʻi under the rule of Kalaniʻōpuʻu, who also had possession of the Hāna district of east Maui; (2) Maui (except the Hāna district,) Molokai, Lānaʻi and Kahoʻolawe, ruled by Kahekili; (3) Oʻahu, under the rule of Kahahana; and (4) Kauai and Niʻihau, Kamakahelei was ruler. It was not necessarily a peaceful time. Island rulers, Aliʻi or Mōʻī, typically ascended to power through familial succession and warfare. In those wars, Hawaiians were killing Hawaiians; sometimes the rivalries pitted members of the same family against each other. In addition to deaths in wars, epidemics of infections added to the decline in Hawaiʻi’s population from approximately 300,000 at the time of Captain Cook’s arrival in 1778 to 135,000 in 1820 and 53,900 in 1876. At about the time Christopher Columbus was crossing the Atlantic to America (1492 – he was looking for an alternate trade route to the East Indies,) exciting stuff was happening in the Hawaiian Islands. The political governance and land management system by Aliʻi-ai-moku, was expanding and developing after two centuries since its inception, and there was a wake of progress taking place on our shores. In this general timeframe, and not necessarily contemporaries, the Aliʻi-ai-moku (Island rulers) across the chain were: Mā‘ilikūkahi on Oʻahu, Piʻilani on Maui, ʻUmi-a-Līloa on Hawaiʻi and Kukona on Kauaʻi. Soon after becoming aliʻi, Māʻilikūkahi moved to Waikīkī. He was probably one of the first chiefs to live there. Up until this time Oʻahu chiefs had typically lived at Waialua and ‘Ewa. From that point on, with few exceptions, Waikīkī remained the Royal Center of Oʻahu aliʻi, until Kamehameha I moved the seat to Honolulu. Māʻilikūkahi is noted for clearly marking and reorganizing land division palena (boundaries) on O‘ahu. Defined palena brought greater productivity to the lands; lessened conflict and was a means of settling disputes of future aliʻi who would be in control of the bounded lands; protected the commoners from the chiefs; and brought (for the most part) peace and prosperity. What is commonly referred to as the ‘ahupuaʻa system’ is a result of the firm establishment of palena (boundaries.) Ahupuaʻa served as a means of managing people and taking care of the people who support them, as well as an easy form of collection of tributes by the chiefs. According to oral tradition, Piʻilani unified the entire island of Maui, bringing together under one rule the formerly-competing eastern (Hāna) and western (Wailuku) multi-district kingdoms of the Island. Chief Piʻilani (“stairway to heaven”) unified West Maui and ruled in peace and prosperity. His territory included Nā Hono a Pi‘ilani, the six West Maui bays, a place he frequented. The Kona Field System was described as “the most monumental work of the ancient Hawaiians.” The challenge of farming in Kona is to produce a flourishing agricultural economy in an area subject to frequent droughts, with no lakes or streams for irrigation. Kukona became a symbol of the very highest ideals of chivalry in battle, was born in Kōloa and fought his defining battle at Poʻipū. During the 15th century, an ambitious chief of Hawaiʻi who had already conquered three other islands, tried to seize Kauaʻi. He was accompanied into battle by the combined armies and chiefs of Maui, Molokai and Oʻahu. The war is known as the War of Ka‐welewele. The much smaller forces defending Kauaʻi, led by Kukona and his son Manokalanipo, soundly defeated the invaders after leading them inland and then surrounding them at the shore. Kukona captured all four chiefs of Hawaiʻi, Oʻahu, Maui and Molokai. He had the opportunity to kill them all and assume leadership over the islands. However, he preferred peace and allowed them to return safely home with a promise that they never again make war on Kauaʻi. This peace lasted for four hundred years. The longest recorded eruption at Kīlauea, arguably, was the ʻAilāʻau eruption and lava flow in the 15th century, which may be memorialized in the Pele-Hiʻiaka chant. It was the largest in Hawaiʻi in more than 1,000-years. The eruption probably lasted about 60 years, ending around 1470. This large volume of lava covered a huge area, about 166 square miles (over 106,000-acres) – larger than the Island of Lānaʻi. Rapid ʻŌhiʻa Death is posing the greatest threat to Hawai‘i’s native forests. A newly identified disease has killed large numbers of mature ʻōhiʻa trees in forests and residential areas of the Puna, Hilo and Kona Districts of Hawaiʻi Island. The disease affects non-contiguous forest stands ranging from 1 to 100 acres. Approximately 6,000 acres from Kalapana to Hilo on Hawaiʻi Island had been affected with stand showing greater than 50% mortality. The disease has not yet been reported on any of the other Hawaiian Islands. Recent investigation indicates that the pathogen progresses up the stem of the tree. Trees within a given stand appear to die in a haphazard pattern; the disease does not appear to radiate out from already infected or dead trees. Within two to three years nearly 100% of trees in a stand succumb to the disease. Currently, there is no effective treatment to protect ʻōhiʻa trees from becoming infected or cure trees that exhibit symptoms of the disease. To reduce the spread, people should not transport parts of affected ʻōhiʻa trees to other areas. The pathogen may remain viable for over a year in dead wood. Click HERE for more information on the Historic Periods, Agriculture Intensification, the 15th Century Rulers and the Forest. The song Moloka‘i Nui A Hina, primarily about Molokaʻi starts ‘Ua nani nā hono a Pi‘ilani’ ‘How beautiful are the bays of Pi‘ilani,’ referencing the view across the channel at northwest Maui, the district the ancients called Kaʻānapali. In the 1500s, Chief Piʻilani (“stairway to heaven”) unified West Maui and ruled in peace and prosperity. His territory included the six West Maui bays, a place he frequented. There are six hono bays: from South to North, Honokōwai (bay drawing fresh water), Honokeana (cave bay), Honokahua (sites bay,) Honolua (two bays), Honokōhau (bay drawing dew) and Hononana (animated bay). This area was extensively terraced for wet taro (loʻi) in early historic and later times. Honokahua Valley has been described as having loʻi lands. Sweet potatoes were reportedly grown between the Honokōhau and Kahakuloa Ahupuaʻa. 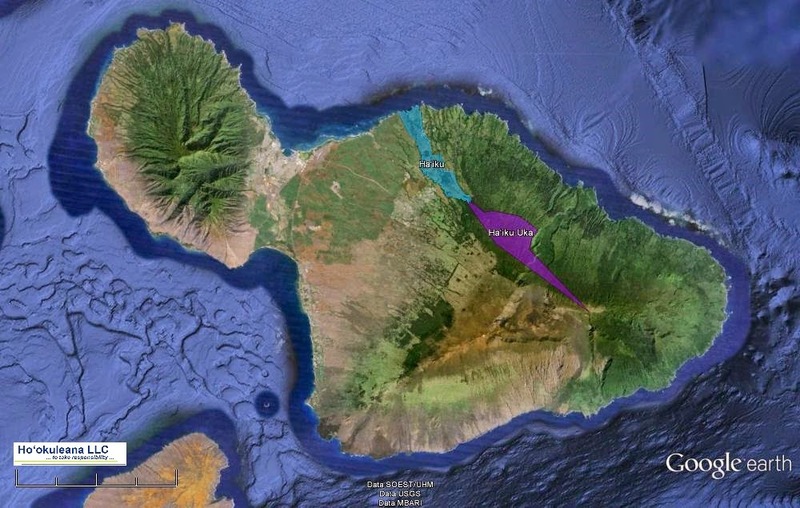 In this area, between that ahupuaʻa of Honokōwai and Honokeana, was Kahana (cutting or turning point,) another ahupuaʻa of the moku (district) of Kāʻanapali. Settlement patterns in the region followed patterns elsewhere, permanent habitation around the coastal and near shore lands, as well as the inland valley land. The forested and ridge-top lands were used for gathering forest products, and for forest plantings of various utilitarian Hawaiian plants. When chief Kekaulike died, his younger son Kamehamehanui (uncle to Kamehameha I) was named heir to rule Maui. In 1738, Kauhi‘aimokuakama (Kauhi,) his older brother, began to wage war to win the title of ruling chief. Several socio-economic factors influenced the later evolution of West Maui. Kahana was right in the middle of these changes and played a role in the transformation. For a couple of decades after 1812 West Maui was an important shipping point for the sandalwood trade. It became a well-known point of call for trading and exploring vessels, whose captains found the open roadstead a safe and convenient anchorage. In 1819, the first American whaling ships reached the islands, and by 1822 there were 34-whalers making Hawaiʻi a base of refreshment. From that time the number increased rapidly. Although Honolulu was originally the port most favored by the whalers, West Maui often surpassed it in the number of recorded visits, particularly from about 1840 to 1855. Another factor to affect the change, growth and social structure of West Maui was the arrival of the first missionaries in the Islands during 1820. The first missionaries to be established at Lāhainā, the Rev. CS Stewart and the Rev. William Richards, arrived in 1823. They came at the request of Queen Mother Keōpūolani, who moved to live in Lāhainā that year. It was not until 1823 that several members of the Lāhainā Mission Station began to process sugar for their own use. The first commercially-viable sugar plantation, Ladd and Co., was started at Kōloa on Kaua‘i in 1835. It was to change the face of Hawai‘i forever, launching an entire economy, lifestyle and practice of mono-cropping that lasted for well over a century. By the 1840s, efforts were underway in West Maui to develop a means for making sugar a productive commodity. James Campbell, who arrived in Hawaiʻi in 1850 ‐ having served as a carpenter on a whaling ship and then operated a carpentry business in Lāhainā ‐ started a sugar plantation there in 1860. The small mill, together with cane from Campbell’s fields, manufactured sugar on shares for small cane growers in the vicinity. His operation became Pioneer Mill. Historically Maui’s second largest industry, pineapple cultivation, had also played a large role in forming Maui’s modern day landscape. The pineapple industry began on Maui in 1890 with Dwight D Baldwin’s Haiku Fruit and Packing Company on the northeast side of the island. West Maui’s roots in the historic pineapple industry began in 1912, when of Honolua Ranch manager, David Fleming began growing pineapple there; almost overnight the pineapple industry boomed. The ranch was soon renamed Baldwin Packers; at one time they were the largest producer of private label pineapple and pineapple juice in the nation; it later became Maui Land and Pineapple. Kahana (situated in the middle of the West Maui resort community) has its share of commercial, condo, timeshare, hotel and other resort improvements along its shore. West Maui is a full‐fledged tourist resort second only to Waikīkī. Tourism is the activity most responsible for Hawaiʻi’s current economic growth and standard of living. A traditional Haiku is a three-line poem with seventeen syllables, written in a 5/7/5 syllable count. Wait … that’s not what this is about. However, this is about a place (Haʻikū) at about the time the Haiku above was written. According to oral tradition, Piʻilani unified the entire island of Maui, bringing together under one rule the formerly-competing eastern (Hāna) and western (Wailuku) multi-district kingdoms of the Island. In the 1500s, Chief Piʻilani (“stairway to heaven”) ruled in peace and prosperity. At the time of Captain Cook’s arrival (1778-1779), the Hawaiian Islands were divided into four kingdoms: (1) the island of Hawaiʻi under the rule of Kalaniʻōpuʻu, who also had possession of the Hāna district of east Maui; (2) Maui (except the Hāna district,) Molokaʻi, Lānaʻi and Kahoʻolawe, ruled by Kahekili; (3) Oʻahu, under the rule of Kahahana; and (4) Kauaʻi and Niʻihau, Kamakahelei was ruler. “At Hāmākualoa Kalaniʻōpuʻu landed and engaged in battle, but Kahekili hastened to the aid of his men, and they put up such a fierce fight that Kalaniʻōpuʻu fled in his canoes. Landing at Koʻolau he slew the common people and maltreated the captives”. During Kamehameha’s later conquest of Maui at Wailuku and ʻIao Valley, his canoe fleet landed at various places along the Hāmākua coast. By 1858, The Haʻikū Sugar Plantation was formed, at the time, there were only ten sugar companies in the Kingdom of Hawaiʻi. Five of these sugar companies were on the island of Maui, but only two were in operation. The five were: East Maui Plantation at Kaluanui, Brewer Plantation at Hāliʻimaile, LL Torbert and Captain James Makee’s plantation at ʻUlupalakua, Hāna and Haʻikū Plantation. The Haiku Mill, on the east bank of Maliko Gulch, was completed in 1861; 600-acres of cane the company had under cultivation yielded 260 tons of sugar and 32,015 gallons of molasses. Over the years the company procured new equipment for the mill. Click HERE for a link to a prior post on Haiku Plantation. In 1871 Samuel T Alexander became manager of the mill. Alexander and later his partner, Henry Perrine Baldwin, saw the need for a reliable source of water, and started construction of the Hāmākua ditch in 1876. With the completion of the ditch, the majority of Haʻikū Plantation’s crops were grown on the west side of Maliko gulch. As a result in 1879 Haʻikū mill was abandoned and its operations were transferred to Hāmākuapoko where a new factory was erected, which had more convenient access to the new sugar fields. Click HERE for a link to a prior post on East Maui Irrigation. Although two missionaries (Richard Armstrong and Amos Cooke) established the Haʻikū Sugar Company in 1858, its commercial success was due to a second-generation missionary descendant, Henry Perrine Baldwin. In 1877, Baldwin constructed a sugar mill on the west side of Maliko Gulch, named the Hāmākuapoko Mill. By 1880, the Haiku Sugar Company was milling and bagging raw sugar at Hāmākuapoko for shipment out of Kuau Landing. The Kuau Landing was abandoned in favor of the newly-completed Kahului Railroad line in 1881, with all regional sugar sent then by rail to the port of Kahului. Brothers Henry Perrine and David Dwight Baldwin laid the foundation for the company in the late-1800s through the acquisition of land. Experimentation with hala kahiki (pineapple) began in 1890, when the first fruit was planted in Haʻikū. In 1903 the Baldwin brothers formed Haʻikū Fruit & Packing Company, launching the pineapple industry on Maui. Maui’s first pineapple cannery began operations by 1904, with the construction of a can-making plant and a cannery in Haʻikū. 1,400 cases of pineapple were packed during the initial run. In time, the independent farmers for miles around brought their fruit there to be processed. At the outbreak of WWII, the Army rented 1,600-acres from various landowners in the Haʻikū area. Buildings went up for offices, tents for living quarters; mess halls were constructed and roads carved out. Post Exchanges opened up; movie screens and stages were built and baseball diamonds were laid out. The 4th Marine Division was deactivated November 28, 1945. In April 1946, the Camp Maui land was returned to the owners. Today, the grounds are now a public park named “Kalapukua Playground” (“magical playground”;) Giggle Hill has a large children’s playground (and some claim they can still hear the laughter of Marines and their girlfriends on dark nights.) The centerpiece of the park is the memorial to the Fourth Marine Division. Click HERE for a link to a prior post on Camp Maui. The image shows the ahupuaʻa of Haʻikū, over Google Earth) In addition, I have included more related images in a folder of like name in the Photos section on my Facebook and Google+ pages. Lots of things were happening in the Islands when Columbus crossed the Atlantic in 1492 on the Nina, Pinta and Santa Maria. About that time, four major leaders ruled over various Islands in the Hawaiian Islands: Māʻilikūkahi on Oʻahu, ʻUmi-a-Līloa on Hawaiʻi, Piʻilani on Maui and Kukona on Kauaʻi. Early in his reign, Māʻilikūkahi moved to Waikīkī and was probably one of the first chiefs to live there (prior to that, Oʻahu chiefs typically lived at Waialua and ‘Ewa.) Waikīkī remained the Royal Center of Oʻahu aliʻi, until Kamehameha I moved the seat to Honolulu. What is commonly referred to as the “ahupuaʻa system” is a result of the firm establishment of palena (boundaries) that Mā’ilikūkahi set up around the Island. This system of land divisions and boundaries enabled a konohiki (land/resource manager) to know the limits and productivity of the resources that they managed. ʻUmi-a-Līloa (ʻUmi) from Waipiʻo, son of Līloa, also moved the Hawaiʻi Island Royal Center about this time, from Waipi‘o to Kona. He, too, started to divide the lands following the mauka-makai orientation. ʻUmi started a significant new form of agriculture in Kona; archaeologists call the unique method of farming in this area the “Kona Field System.” (These are long, narrow fields that ran along the contours, along the slopes of Mauna Loa and Hualālai; farmers then planted different crops, according to the respective rainfall gradients. Piʻilani’s reign showed a boom in construction of heiau, fishponds, trails and irrigation systems. Famed for his energy and intelligence, Piʻilani constructed the West Maui phase of the noted Alaloa, or long trail (also known as the King’s Highway;) his son, Kihapiʻilani laid the East Maui section and connected the island. Kukona, on Kauaʻi became a symbol of the very highest ideals of chivalry in battle. He once captured all four chiefs of Hawaiʻi, Oʻahu, Maui and Molokaʻi and had the opportunity to kill them all. However, he preferred peace and allowed them to return safely home with a promise that they never again make war on Kauaʻi. Columbus wanted to find a new route to the Far East, to India, China, Japan and the Spice Islands. If he could reach these lands, he would be able to bring back rich cargoes of silks and spices. Columbus called all the people he met in the islands Indians because he was sure that he had reached the Indies. When Columbus reached Cuba, he thought it was the mainland of Japan. “At the time of his death their true significance had not yet begun to dawn upon the mind of any voyager or any writer.” Still believing that he had found a new route to the East Indies, Columbus died in 1506. 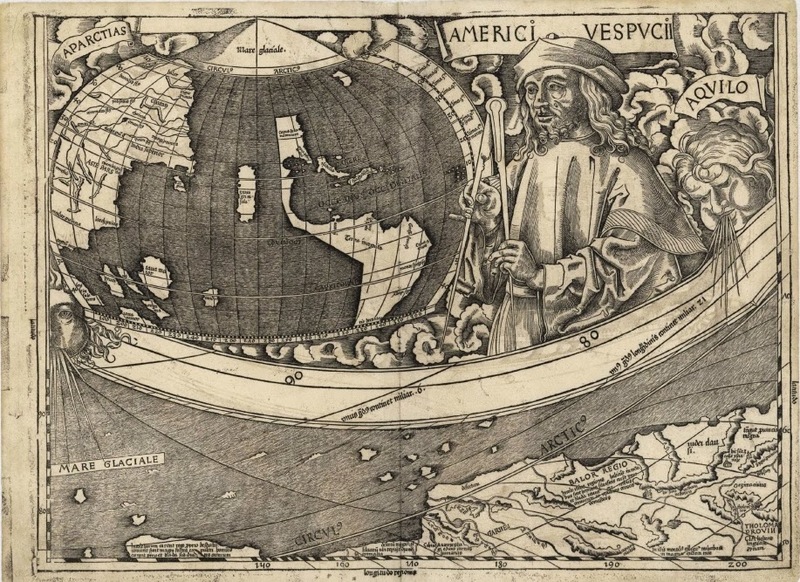 Columbus found the new land; but Vespucci, by travelling down the coast, came to the realization that it was not India at all, but an entirely new continent. What should they call it? Waldseemüller and Ringmann were at work on a reproduction of Ptolemy’s treatise on geography, to which they were adding a preface entitled ‘Cosmographiae Introductio.’ They determined to incorporate the story of Amerigo Vespucci’s voyages into this work, and Ringmann, who was acting as editor, wrote an introduction. But the new name didn’t completely catch on, at first. The Pilgrims, in signing the Mayflower Compact (1620,) noted they were headed to Virginia. The Massachusetts Bay Colony (1628) and its initial laws Massachusetts Body of Liberties (1641) reference being in New England. In the mid-1700s, the British Colonies were referenced into the New England Colonies (northern,) Middle Colonies and Southern Colonies. The earliest recorded use of this term in English dates to 1648, in Thomas Gage’s The English-American: A New Survey of the West Indies. Back to Columbus … President Franklin D Roosevelt created the first federal observance of Columbus Day in 1937; Richard Nixon established the modern holiday by presidential proclamation in 1972. Columbus Day is observed the second Monday in October; it’s a federal holiday, it is not a State holiday in some states. The image shows a portion of the map prepared by Martin Waldseemüller and Matthias Ringmann, noting ‘America.’ In addition, I have included other related images in a folder of like name in the Photos section on my Facebook and Google+ pages. Although the canoe was a principal means of travel in ancient Hawaiʻi, extensive cross-country trail networks enabled gathering, harvesting other necessities for survival. Famed for his energy and intelligence, King Piʻilani and his son Kiha constructed the legendary Alaloa or long trail known as the King’s Highway. It was built about the time Christopher Columbus was crossing the Atlantic, before there were roads in Hawaiʻi. Back then, they were trails and Piʻilani was ruler of Maui. According to oral tradition, Piʻilani unified the entire island of Maui, bringing together under one rule the formerly-competing eastern (Hāna) and western (Wailuku) multi-district kingdoms of the Island. Piʻilani ruled in peace and prosperity. Four to six feet wide and 138-miles long, this rock-paved path facilitated both peace and war. It simplified local and regional travel and communication, and allowed the chief’s messengers to quickly get from one part of the island to another. The trail was used for the annual harvest festival of Makahiki and to collect taxes, promote production, enforce order and move armies. The southeastern section of the island of Maui, comprising the districts of Hāna, Kīpahulu, Kaupo and Kahikinui, was at one time a Royal Center and central point of kingly and priestly power – Piʻilani ruled from here (he built Hale O Piʻilani – near Hāna.) This section of the island was also prominent in the later reign of Kekaulike. Royal Centers were where the aliʻi resided; aliʻi often moved between several residences throughout the year. The Royal Centers were selected for their abundance of resources and recreation opportunities, with good surfing and canoe-landing sites being favored. With the development of the whaling industry on the island in 1880s the southeastern Maui population started to decline as people moved to main whaling ports, such as Lāhainā. In the early-1900s, one of the regular ports of call for the Inter-Island Steam Navigation Company was here at Kīpahulu. Steamships provided passenger service around Maui and between the islands. However, shortly after World War II, Paul I Fagan, an entrepreneur from San Francisco, bought the Hāna Sugar Co, formed a ranch and started tourism on this part of Maui. It had been only 20-years since Hāna was linked to the outside world by a rough dirt road, and it would be almost two decades more before it was paved. This part of the Park is located about 15-minutes past Hāna town, near mile marker 42 on the Hāna Highway (Road to Hana) after it turns into Highway 31. 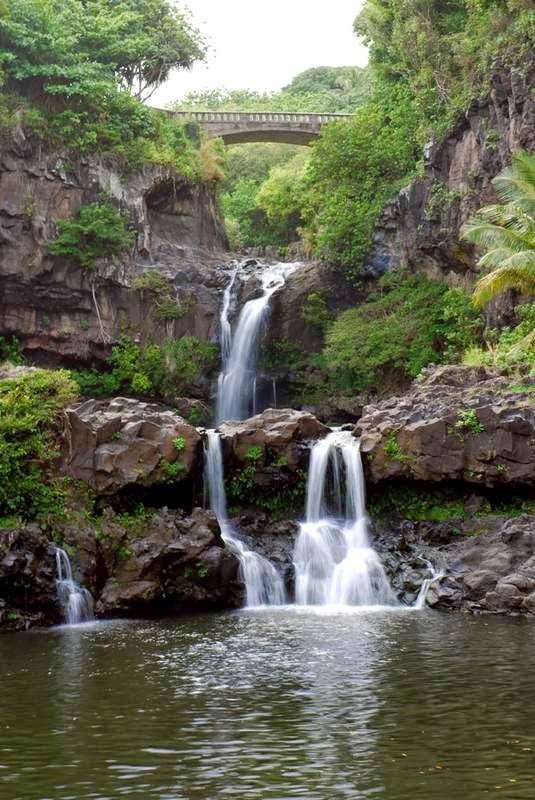 Attractions include the ʻOheʻo Pools, a car-accessible campground and several maintained trails, such as the four-mile Pipiwai Loop Trail to Waimoku waterfall. The image shows some of the ʻOheʻo pools. In addition, I have added some other images in a folder of like name in the Photos section on my Facebook and Google+ pages.